Have you noticed that new menu item above that says Budding Chefs? I’ve been working on my little idea for some time, and am now happy to announce Budding Chefs, a portion of my site geared just towards kids in the kitchen. I’ll be tailoring posts, recipes, tips and all sorts of culinary information just for kids on those pages. You can go to that page and subscribe by email or RSS feed to make sure you don’t miss out on a single post. 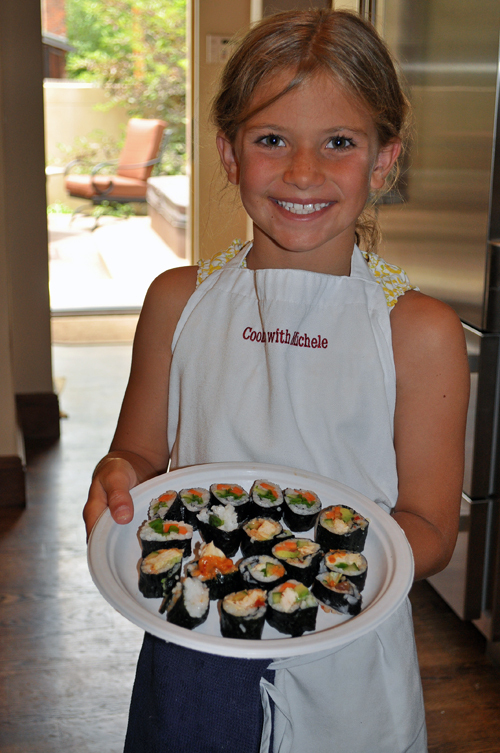 Budding Chefs posts will run on Saturdays, and the first post there unveils the summer kids’ cooking class schedule – that’s Chloe above, showing off the sushi she made in one of my classes a couple of summers ago. The kids’ classes fill quickly, so please do call or email me to sign up your kids and any of their friends! Have anything you’d like to see me address on the new Budding Chefs page? Just comment below or send me a note! Happy Cooking! S’Mores Ice Cream – Happy Fourth of July! Door to Door Organics Produce Box Giveaway! What a great idea. I will pass this on.